Become a Member & Join the "Karma Club" Today. After all, "What Goes Around, Comes Around!" Planned Acts of Kindness is a global outreach program where people wake up and on their cell phone, computer or device there is a new daily planned act of kindness that they can do with their family, friends, co-workers and in their community. The goal is to have tens of millions of people around the country, hundreds of millions of people around the world, waking up and doing the same thing on the same day, and unleashing that much powerful, positive energy in the world. 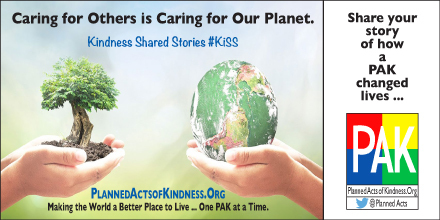 Planned Acts of Kindness works to unite people from all walks of life by giving them shared goals and objectives that work for the betterment of the kids, people and the planet. Our Vision is to have millions of people around the world working together as one to help solve the problems that confront Quality of Life for All on our planet. The Karma Club is a community of people that perform Planned Acts of Kindness. 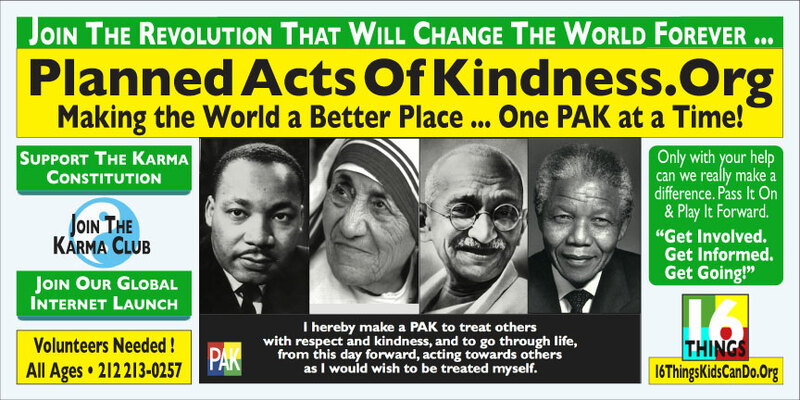 Membership is 100% free, so become a member today & start changing the world one PAK at a time! 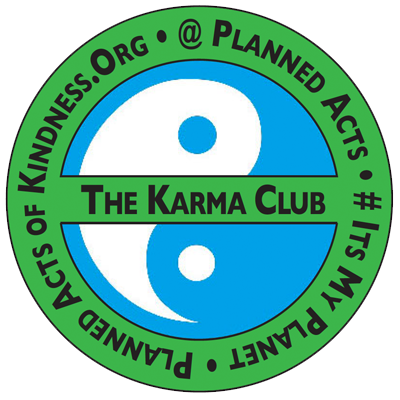 To get started first register a Planned Acts of Kindness account and then you can join the Karma Club and start to make more of an impact in today’s world. The Daily PAKs are the creation of program founder, Lyle Benjamin. Each day you given a Planned Act of Kindness that you can carry out any time during the day and then share your experience on Twitter to raise awareness. You will learn more once you are a member of PAK and The Karma Club. Be sure to join today! Join Planned Acts of Kindness & use Twitter to Spread the Word. Membership to PAK and The Karma Club is free and once you register on our site you can then opt-in to The Karma Club and get started with your Daily PAKs, Volunteering and Donations. The more you participate, the greater the reward. Why not join today? 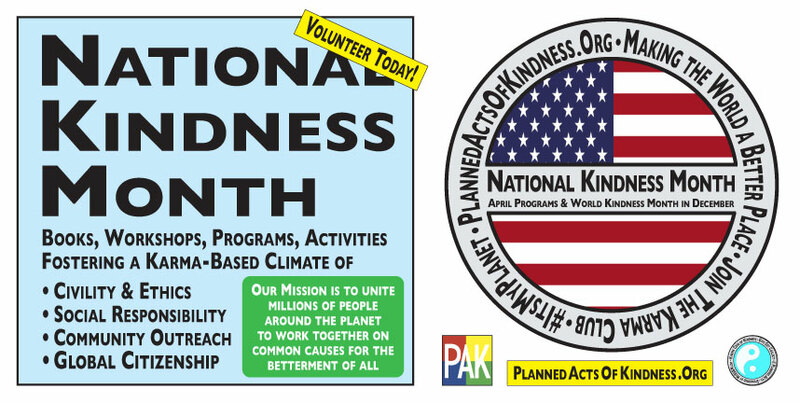 Volunteering is a key component to making Planned Acts of Kindness work. From connecting to people of influence to policy makers at all levels of our Government, we need your help to make a positive change sooner, rather than later. Why not join today? Donations can come in many forms. From traditional cash donations to the offering of goods or services is also welcome. 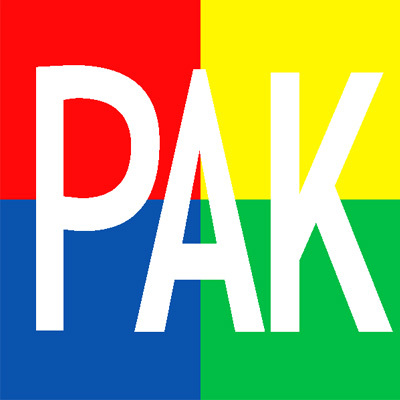 We also have PAK products and our “Shop & Save” program which all profits are donated to PAK programs. Help us spread more kindness today! How can you help make a positive change in the lives of others? Learn how the positive energy you put out in the world through your actions … can also come back to help you, your family and your future. Most of us have heard stories on the news about someone who has done some random act of kindness that really tugged at our collective heartstrings. And for the vast majority of us sitting at home or at work in our chairs and sofas, the feelings registered and were gone with the introduction of the next commercial or story. Planned Acts of Kindness automatically provides the “What you can do” on a daily basis to help others. Everyday it’s right there in front of you. All you have to do is take action. And the more you do, the more you’ll want to do because of how it helps others and helps yourself at the same time. The Karma Club automatically provides you with the “How” to document and record your actions, and rewards you based on your karma and your achievements. As for the “Why” of it? Well, in additional to the Karma Club loot you can score, there are many compelling reasons “why” we need to change to a more proactive lifestyle based on kindness. Why do your daily planned acts? One reason is that helping others is just the right thing for us to do as a species. For too long we have been divided by a growing lack of civility toward others that don’t share our opinions. We have the power of choice and it’s time we actively worked at helping people in need regardless of skin color, nationality, religion, gender, age, education or income. Why do your daily planned acts? Another reason is that helping others on a sustained basis grants you, the do-gooder, with Karmic Rewards. People with active social connections to family, to friends, to community are happier, physically and mentally healthier, and they live longer than people who are less well connected. Kind of like their own Custom Benefits Plan. The more you invest, the greater your rewards can be in these essential areas. Why do daily planned acts? And the third reason that comprises the big three is that the world is in crisis. In 10 to 20 years problems like climate change, pollution, war, terrorism and overpopulation could reach tipping points and irrevocably change the world for the worse for billions of people. We cannot rely on governments, companies or religions to act in the collective interests of the planet … we have to take matters into our own hands and force these same institutions to make the necessary changes for the continued well-being of kids, people and the planet. Imagine tens of millions of people mobilizing into a powerful unified voice to combat government or company pollution … with numbers plus action we have the strength and ability to change problems into solutions. The word “Karma” literally means “deed” or “act” and more broadly names the universal principle of cause and effect, action and reaction, which Hindus and Buddhists believe govern all consciousness. In simple terms, Karma is the law of causality where good deeds, words and thoughts lead to beneficial outcomes for a person, while bad deeds, words and thoughts lead to harmful outcomes. Good actions and intentions reap good rewards. Bad actions and intentions result in suffering and pain. In essence, Karma acts to shape an ethical worldview that works to govern individuals and the moral order of society and the universe. Karma is not fate: Our actions are our own to choose, and we create our own destinies. We have the freedom to act, but not always to escape the consequences of our actions. And, despite the apparent lack of justice in the world, a life of love and compassionate action is never wasted because the mysteries of karma and good fortune are not always readily discernible. What we do (and don’t do) today, tomorrow, and in the foreseeable future, is going to determine the fate of life on this planet. 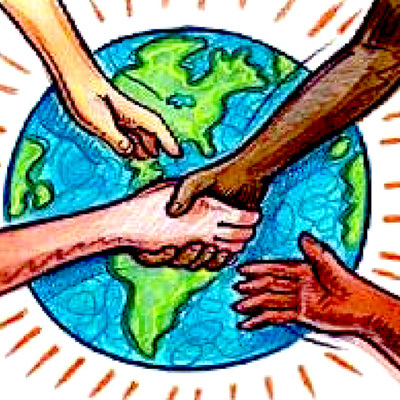 We the Children of the World Unite as One People in Order to Preserve, Protect, Nurture and Grow the Health of Our Planet and Our Global Community; and, do ordain and establish this Karma Constitution for All. The Karma Club is hereby designated as the Global Organization for Supporters of the Karma Constitution. Joining the Karma Club is, and always will be, free and open to all the Children of the World regardless of race, color, gender, age, culture, social, economic, political condition or religious ideas. Supporters of the Karma Constitution who join the Karma Club are initially referred to as Members; e.g., Members of the Human Race. 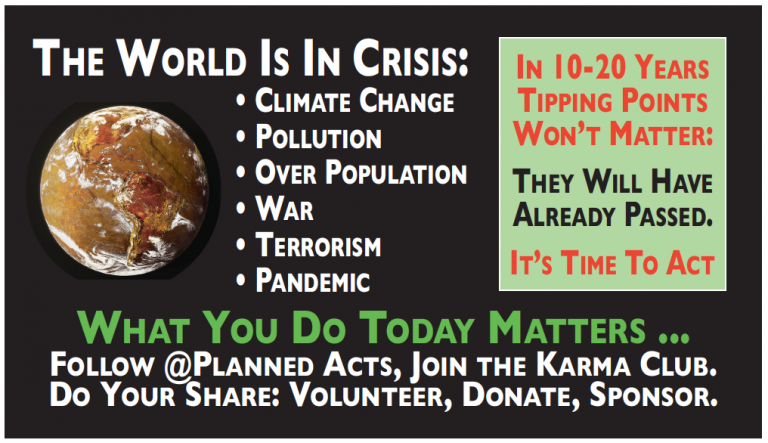 Members of the Karma Club are encouraged to distribute their PAK Pledges through Social Media for all the world to see. Members of the Karma Club are encouraged to perform four different types of activities during the course of each month. Members that perform the requisite number of actions in all four activities can level up to the next Karmic level. Action: Members of the Karma Club are encouraged to take action for the benefit of their family, friends, co-workers and community by completing and sharing their finished Planned Acts of Kindness on a daily basis. Outreach: Members of the Karma Club are encouraged to inspire others to take action by having them join the Karma Club and take the PAK Pledge. 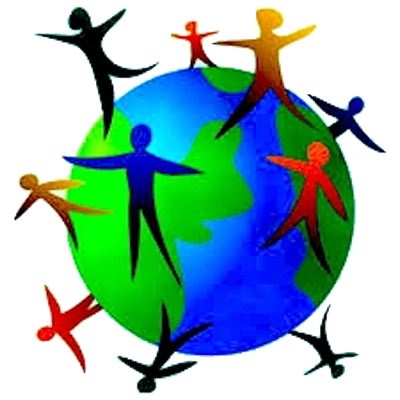 Volunteering: Members of the Karma Club are encouraged to show their commitment to the Bettering the World by Volunteering and taking part in “16 Things Kids’ Can Do” programs around the world. Support: Members of the Karma Club are encouraged to Support “16 Things Kids’ Can Do” outreach programs by securing donations, sponsorships and grants. The Executive Power shall be vested in an Executive Director of the Karma Club, who shall be one and the same individual as the President of 16 Things Kids Can Do, Inc. The Executive Director shall have the duty and responsibility to appoint the President, Vice-President, Secretary, Treasurer, etc. of each Karma Club around the World. All Karma Club Officials shall serve at the discretion of the Executive Director. The final selection for the “Person of the Week” shall reside with the Executive Director. The final selection for the “Cause of the Month” shall reside with the Executive Director. Members of the Karma Club are encouraged to build connections with others in the Global Community to further the mission and vision of the Karma Club, Planned Acts of Kindness, and 16 Things Kids Can Do, Inc.
Members of the Karma Club are encouraged to submit new ideas and proposals with the objective of furthering the mission and vision of the Karma Club, Planned Acts of Kindness, and 16 Things Kids Can Do, Inc. This Constitution, and the Principles contained herein shall be made in Pursuance thereof; and all Treaties made, or which shall be made, under the Authority of the Children of the World, shall be the supreme Law of the Land; and the Members in every Community shall be bound thereby, anything in the Constitution or Laws of any Nation to the Contrary notwithstanding. Each day Karma Club members all over the world will wake up and on their cell phones, computers and devices, there is a daily Planned Act of Kindness that they can do with their family, friends, co-workers and in their community. “Planned Acts of Kindness” is a global outreach program where people around the world wake up, and on their cell phones, computers, and devices, there’s a new planned activity that they can do with their family, friends, co-workers and in their community. The goal is to have millions of people around the world doing the same thing, on the same day, and unleashing that much positive, powerful energy into the world. The problems in the world are not going to be solved by governments, corporations or religions, but by ordinary people coming together for a common cause: Working for the betterment of kids, people and the planet. But it’s not enough just to put things out there … People who do good things, important things, should be acknowledged and rewarded for their actions. Members that achieve all four objectives during the month— level up and are then eligible for Karma Club rewards! Which are pretty cool. After all, “What goes around, comes around. And that’s what the program is about: The positive energy you put out to help others can come back to help you, your family and your future. Now, all you have to do to get started … is follow one simple word: Act. Whatever your reason(s), everyone’s journey starts with the first step. Where you go from there is entirely up to you. The Karma Club was created to be a benefit for everyone: From the people that perform the PAKs, to the people that are touched by them. But it is what you make it. Put in minimal effort and you’ll get back minimal returns. Do more of the daily PAKs and other outreach programs, and a world of possibilities will open up for you in ways that you never could have imagined. And as your Planned Acts of Kindness multiply, may your life be infinitely blessed. Daily PAKs are the creation of program founder, Lyle Benjamin. As such, they reflect *his outlooks, views, writing sensibilities and humor … or lack thereof. Any references made to things past, present and future are just that … references made to things past, present and future. That said, I sincerely hope you enjoy your Daily PAKS, and our effort to bring people together to make some positive noise in the world. IMPORTANT NOTE: Log-in daily to discover your PAK. C. Record you completed PAK back here on the site using the entry system below. 4. 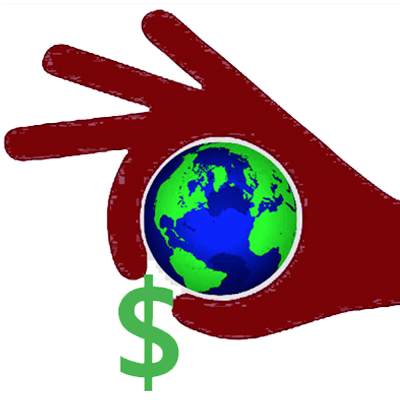 Donations: Obtain $10 in donations to help support 16 Things outreach programs. Members that achieve all four objectives during the week, level up and are then eligible for PAK give-away prizes! 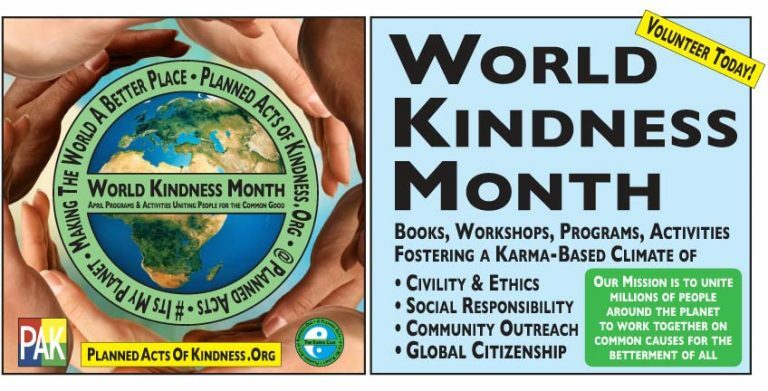 Planned Acts of Kindness is a program of 16 Things Kids Can Do, a 501(c)3 Non Profit Educational Organization that works for the betterment of kids, people and the planet through a series of books, workshops, programs and activities all designed to help people lead happier, healthier and more successful lives. We invite you to join us on our mission. And what do all these doomsday scenarios have in common? Us. They are all manmade problems that have escalated with the speed of a bullet over the last 100 years. Estimates are that by the year 2035, we will be at a tipping point where our efforts will no longer make a difference. So now the question is, “What are we going to do about it, if we are going to survive?” We need to make a significant change in our approach to these issues. We can no longer rely on governments, corporations or religious leaders to save us. Whatever we are going to do, we need massive numbers of people around the world on-board, and we need to start now. The Karma Constitution seeks to unite people from all around the world to act for a common cause with one long-term goal: The survival of the planet. The Constitution forms the foundation of Planned Acts Of Kindness, a global social responsibility program where each day people around the world wake up, and on their cell phones and on their computers, there’s a new planned activity they can do with their family, friends, co-workers and community. 4) We have to take action on what we learn, and follow a game-plan even though the path may be difficult. And when people need to take action over a longer time-frame on a particular issue, there is the “Cause of the Month,” program because some things are too important for just one day. The Karma Constitution and Planned Acts of Kindness are the creation of Lyle Benjamin, Executive Director of 16 Things Kids Can Do, a non-profit educational organization that works for the betterment of kids, people, and the planet through workshops, books, programs and activities designed to help people lead happier, healthier, more successful lives. In order to get people motivated and engaged over the long-term, Benjamin created The Karma Club, where people can level up each month based achieving milestones in different PAK (Planned Acts of Kindness) tasks. When members level up, they automatically become eligible for that level’s rewards given away each day for a month, beginning on the first of each month. If you’re unhappy with the direction your community, your country or the world is heading, you need to become part of the solution: Take the first step now by becoming a member and help spread the message on your social network for people to check out PlannedActs.Org as it works to make the world a better place to live … one PAK at a time. 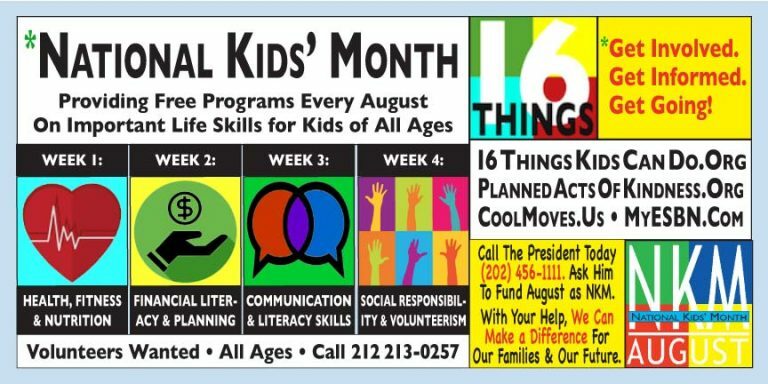 For more information on how your school, church/temple, non-profit, organization, agency or business can make a difference in your community, please contact Elissen Wang at (212) 213-0257 or email: Support@16ThingsKidsCanDo.Org. Climate Change: People are losing their homes and businesses, people are dying, and the emotional and financial impact is not only devastating individuals and families, but also entire communities. 14 of the hottest annual temperatures ever recorded have occurred during the last 16 years. l cyclones with higher wind speeds. Global temperatures began to be systematically recorded 136 years ago. 2016 finished in first place as the hottest year on record. 2017 is shaping up to be even hotter. And, as a consequence, natural disasters are occurring more frequently, causing destruction and loss of life around the globe. September Arctic sea ice is declining at a rate of 13.3 percent per decade. 97% of researchers believe global warming is happening, and 82% agree that it’s strongly linked to human behavior. Along the U.S. coastline, flooding is now 300% to 900% more frequent than it was 50 years ago. The actions of humans have caused extinctions of plants and animals for hundreds of years. Now, global warming is taking place 10 times faster than any time in the past 65 million years. Plants and animals will face mass extermination as they fail to adjust. The toll of terrorism around the globe has jumped 800% in the past five years. Nearly 30,000 people per year have been killed by terrorists since 2010. As time progresses, the number of people murdered increases. Terrorists are improving their use of tech and finding new ways to recruit and kill more and more people. In 2015, a total of 11,774 terrorist attacks occurred worldwide killing 28,300 and injuring more than 35,300 people. According to professors’ Clauset and Woodard, the certainty of a terrorist attack with a death toll greater than 9/11 is at 95%. Families and communities have been ripped apart and devastated because of the because of the devastation left behind by terrorists. In 2015 alone, the number of terrorist kidnappings and hostage-takings increased to more than 12,100. Over 500,000,000 people have died as a direct result of war violence. The detonation of just one “small” nuclear weapon would annihilate a 100,000 people in the blink of an eye and condemn tens of thousands to the pain and agony of death by radiation poisoning. The effect of a large thermonuclear weapon detonated over a major urban city would wipe out millions of people in an instant. In the event of a nuclear war, 90% of the surviving world’s population would likely die from starvation as the world’s food crops perish due to climate change. Since the first local case of Zika virus was confirmed in Brazil in May 2015, health officials estimate between 440,000 and 1.3 million people have contracted the virus. When the global population was 450 million in the 1340s, estimates are as many as 200 million people perished from the Bubonic Plague. During the 1918 flu pandemic, 100 million people were estimated to be killed. Juveniles, elderly and young adults were forced to spend their last days in overcrowded medical camps and hospitals where their deaths were prolonged and painful. The 2003 SARS epidemic, which killed fewer than 800 people, cost the global economy $54 billion. June 13, 2015. The Ebola virus spread to more than 27,000 people across ten countries violently killing 11,100 people as their organs rapidly liquefied. Despite the high number of infections, the spread of Ebola remains technically an outbreak. The Ebola outbreak killed more than 5,000 people before the global community took action. If we aren’t ready for an outbreak, we most definitely are not ready for a pandemic. Now, two years later, we still don’t have the answers to how it started or how to cure it. The worldwide pharmaceutical market is a $1 trillion plus industry. Vaccines make up only 3% of it. The financial toll from a severe flu pandemic could hit $4 trillion. Overpopulation is a crisis that cannot be averted. Between 1999 and 2011, global population increased by a billion people. Most of this population increase took place in developing nations where resources are already limited. The world population is currently growing at a rate of around 1.11% annually. The current average population change is estimated to be at around 80 million per year. Recent reports show that about 783 million people, or about 10% of the world population, are lacking access to quality drinking water. Every twenty minutes, the human population grows by over 3,000 people. That’s the same amount of time that it takes for another plant or animal species to become entirely extinct. In the 20th century alone, the worldwide human population has grown from 1.65 billion to 6 billion. Meanwhile, three species are going extinct every hour. 30,000 species per year. Since 1970, the U.S. population has added more than 100 million residents, about a 50 percent growth rate in fewer than 40 years. In the US, there are more than 1.43 million unplanned births happening every year. Thank you for your interest in our programs, and we look forward to understanding your “Why.” Why do you want to make a difference? And, what are you willing to contribute to make that difference happen? All too often, people talk about problems, but then do nothing themselves to help make the situation better. Others want to get involved in something meaningful, but find their choices limited to handing out food at a soup kitchen or food bank … while others just walk a few miles once a year. 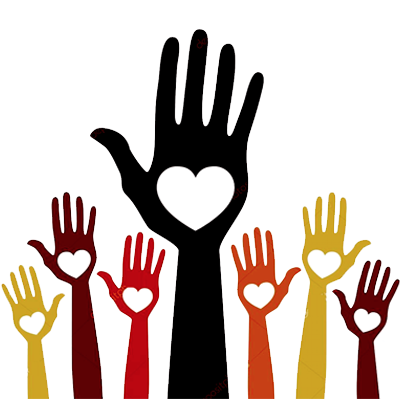 • Are the volunteer activities you’re doing really significant? • If you didn’t do it, would it still get done? • Are you unintentionally discriminating against others in what you’re doing? • Are you really impacting the lives of others in a meaningful, long-lasting way? • Are you able to continuing build on what you’re doing to have a greater and greater impact? • Are you activity affecting your community? • Are you working on positive change for your country, the planet? Our social activism club doesn’t discriminate in membership acceptance or in who we help. We accept people from all different backgrounds, ages, educational levels, income, religion, gender, country of origin. And we work to help everyone. 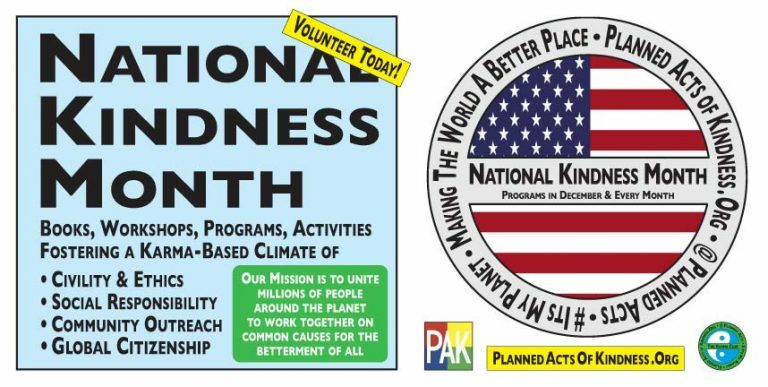 You can submit a Planned Acts of Kindness Pledge or PAK Suggestion by sharing it on Twitter, Facebook or by sending it to us in an email. Try it and let the world know about your kind acts and ideas for others to join in. Together we can help make the world a better place by each doing our part. If even half of the people reading this website right now start to make an effort to be kinder to each other it would go a long way to healing our differences and in turn will start to heal the planet. Together we can help avoid the tough times we live in. We must make an effort to make the planet healthy for our children. By participating with us on social media it will show a wider audience the kindness you are putting out everyday and in time others will do the same. People get inspired by others good deeds, the more you do, the more people will join the movement to be kinder to each other as well as pay attention to the planet as a whole. We invite you to join us on both Facebook and Twitter to spread the kindness. Feel free to post a message on our Facebook page or tag us in a Tweet. You can also use our hashtags like #PlannedActsOfKindness #KarmaClub and #ItsMyPlanet. Making The World a Better Place To Live … One PAK At A Time! PAK and the Karma Club are part of the Global Social Responsibility Outreach Programs of Planned Acts, a 501(c)3 Non-Profit Educational Organization that works for the Betterment of Kids, People & The Planet through a series of books, workshops, programs and activities all designed to help people lead happier, healthier and more successful lives by providing education & action programs to empower people of all ages to achieve their objectives & transform their lives.